A marriage in Russia is a whole bunch of traditions and old rituals which are passed on from generation to generation. Many of these traditions are connected to the pagan past, some of them appeared during the Soviet Union times, and others are borrowed from different countries. But the majority of the Russian wedding traditions doesn’t change and are compulsory for the bride and groom. The preparations for the Russian wedding usually starts six months earlier the big date. During this period both sides decide on the place of the banquet, buy rings, wedding dress for the bride and a suite for the groom, book the photographer, etc. Let’s stop on the main and most common Russian wedding traditions. Among those are the matchmaking, viewing of the bride (optional), the bachelor and the bachelorette parties. Now, after some transformations, during the matchmaking, the parents of the groom come to the bride’s house to discuss the details of the upcoming wedding. In early days instead of parents, there were special people – matchmakers – who came to ask for the girl’s hand and praise the potential groom. Back in the old days weddings were celebrated in autumn after they gathered the harvest. Also, according to popular beliefs, the days of fasting and great religious holidays are bad time for a celebration. 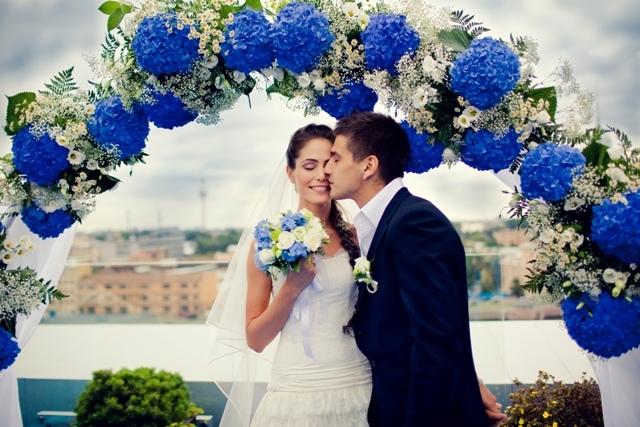 Nowadays, more and more couples choose to arrange their wedding in spring or summer because of the warm weather. The most popular months are from June to September. From the days of the week it is common to choose Friday or Saturday. And note that a traditional Russian wedding lasts for two days. On the second day the newlyweds and the guests continue the celebration usually at someone’s house. Before the actual wedding date there are a lot of things to be done. Wedding rings are usually bought by the groom. Those are made of gold or platinum depending on the tastes or financial possibilities. Russians wear the ring on the right hand as opposed to the Western traditions. The dress for the bride and the suite for the groom can either bought or rented, the latter especially concerns the dress. Russian women for marriage ceremonies choose white or ivory dresses. Then go the renting of a car for the transportation during the wedding day and booking the restaurant. It is important to hire a tamada – the wedding planner. Some of those are really funny. For example, there is a tradition to steal the bride and demand a ransom to bring her back. The ransom includes money, silly dances or singing, and whatever the ‘kidnappers’ can think of. Then, there is a tradition for the guests to shout “Gorko!” which obliges the newlyweds to get up from their seats and kiss. And of course, what wedding go without a wedding dance and throwing of the bridal bouquet? The last two came to Russia from the western countries. A Russian wedding consists of several stages. Before the ceremony at ZAGS (a marriage registry office) the bride and the groom get ready to the event. To prepare the Russian girls for marriage there are make-up artists and hair-dressers coming to the bride’s house early in the morning. A groom at this time manages not only to dress up but also arrive to his wife-to-be. Here he must pass several tests or try-outs arranged by the relatives of the bride. Usually these trials include funny missions to be completed either with wits or money. After the successful passing of the tasks the groom can take his bride to the marriage registry office. This is the official part of the Russian wedding. After the couple has entered the registration office, they are escorted to the main hall where the ceremony is held. It is 15 minutes long. During this time the two people exchange wedding rings and say “I do” to the official. Then they sign the marriage certificate and are pronounced husband and wife. Optionally, the couple also goes to church to be married according the orthodox rules. This ceremony is two-hours long and is known for its beauty and solemnity. After the official ceremony the newlyweds depart for the photo shoot either to the professional studio or around the city with a photographer. They choose picturesque and other significant places. Usually the guests are also present at this stage. They drink champagne and have fun while the happy couple is busy making photos. Some part of the guests, though, goes straight to the restaurant where they wait for the couple to arrive. If you think that the main part of the wedding in Russia is the actual wedding ceremony, you cannot be further from the truth. It’s the banquet hall where the real party begins. Before entering the restaurant the couple is welcomed by the guests and the wedding planner. Here, the both parents offer the newlyweds bread and salt as the symbol of prosperity and protection from bad luck. The two people are supposed to take a lump of bread with salt and feed each other. It is compulsory to have a lot of food and drinks on the tables – Russians like to eat well. If someone is hungry the wedding is considered a failure. Another important attribute of the wedding is entertainment – a lot of singing and especially dancing. The wedding planner ensures everything to go as scheduled. There are funny competitions among guests such as quizzes and games. As for the gifts, the most common are money and a honeymoon trip (usually presented be the parents). It all depends on the finances. Among other significant parts of a wedding banquet are the first dance of the newlyweds and the dance of a bride with her father. And don’t forget about the throwing of the bouquet and the stealing of the bride. Sometimes there are also fireworks at the evening closer to the end of the event. As for today, Russian weddings are starting to be influenced by the western traditions. A lot of couples try to oppose some of the old rituals, which to their mind are ridiculous and absolutely unnecessary. Instead, a lot of Russian ladies for marriage ceremonies adopt the western style weddings. For example, not long ago there appeared a “something old” tradition, according to which a bride must wear to her wedding something old, new, borrowed and blue. Also, before you marry a Russian girl you have to make a romantic proposal with a ring. Other foreign traditions include the engagement party, the throwing of the bridal bouquet, and inviting more than one bridesmaid to accompany the bride. Also, recently it has become very popular to arrange the wedding ceremony outdoors, by the sea or on the deck of a ship. It all depends on the wedding couple desires and fantasy. Theme and extreme weddings are also in favor. Some couples decide to get married under the sea or in a hot-air balloon. In order to marry a Russian woman, one must be ready to follow a lot of traditions and wedding rituals. But, to say the truth, all of them are really fun and unforgettable. Nevertheless, it is possible to plan everything the way you want, throwing away some boring traditions and adopting modern ones.